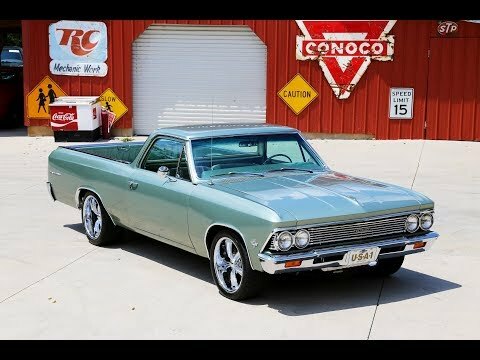 Up for sale we have a 1966 Chevrolet El Camino. It has under gone a frame off restoration with multiple upgrades. When the restoration was done the paint work was done by a GM Dealer in Georgia. We were told one quarter panel was replaced and that the rest of the sheet metal was good. Both doors have great gaps and the hood has a very good fit. This Chevy is covered in the Artesian Turquoise paint that's slick. A lot of the chrome on this '66 was replaced like the bumpers, emblems, and mirrors. The stainless is all very nice as well with a lot of it having been replaced too. All the glass is in great condition with front windshield appearing to have been replaced along with the seal. To finish off the look it's sitting on a set of 18” Boss Wheels and Nitto Tires. On the inside, it features a brown and tan two-tone color combo that compliments the exterior perfectly. The seat cover was replaced and all the padding is great. The matching door panels were also replaced and look great along with the metal trim that's painted body color. The carpet, headliner, visors, and rear-view mirror are like new as well. Looking at the dash the metal is painted body color and is very nice. The speedo and gas gauge are working and all the trim looks very good. This El Camino has been upgraded with Vintage AC and the controls are in the factory location. Under the hood it features a fresh built 400 Small Block that was bored .30 over to a 406. It's set up with Aluminum Heads, Polished Aluminum Intake, and a Holley Carb and is dressed in the Polished Valve Covers and Breather. Also, the pulleys are Chrome along with the Power Steering Pump. To go along with Power Steering and Air Condition, this El Camino has Power Brakes with disc up front and new lines installed. The gas tank was also replaced and has had new lines installed as well. To keep this '66 cool it has been upgraded with an Aluminum Radiator. For exhaust, it has Headers with dual pipes Chambered Mufflers. When you look under it you will see the 400 is mated to the 350 Turbo Trans and 10 Bolt Posi Rear with 3.23 gears. Under the front end it all appears to be rebuilt with new ball joints and bushings. You can tell they did a great job on this frame off resto as the floors and frame in this El Camino look amazing.